عبداله زاده, غلامرضا, حقیقی, فرشیدرضا, طاهری امیری, محمدجواد, راستگو, سیما. (1395). ارزیابی خطرپذیری لرزه ای پل‌های شهر بابلسر در حالت بهره‌برداری با استفاده از روش FMEA-FUZZY. پژوهشنامه حمل و نقل, 13(3), 52-65. غلامرضا عبداله زاده; فرشیدرضا حقیقی; محمدجواد طاهری امیری; سیما راستگو. "ارزیابی خطرپذیری لرزه ای پل‌های شهر بابلسر در حالت بهره‌برداری با استفاده از روش FMEA-FUZZY". پژوهشنامه حمل و نقل, 13, 3, 1395, 52-65. عبداله زاده, غلامرضا, حقیقی, فرشیدرضا, طاهری امیری, محمدجواد, راستگو, سیما. (1395). 'ارزیابی خطرپذیری لرزه ای پل‌های شهر بابلسر در حالت بهره‌برداری با استفاده از روش FMEA-FUZZY', پژوهشنامه حمل و نقل, 13(3), pp. 52-65. عبداله زاده, غلامرضا, حقیقی, فرشیدرضا, طاهری امیری, محمدجواد, راستگو, سیما. ارزیابی خطرپذیری لرزه ای پل‌های شهر بابلسر در حالت بهره‌برداری با استفاده از روش FMEA-FUZZY. پژوهشنامه حمل و نقل, 1395; 13(3): 52-65. پل­ها با هر شکل سازه­ای و با هر نوع مصالحی که ساخته شوند، دیر یا زود اثرات فرسودگی در آنها ظاهر می­شود. 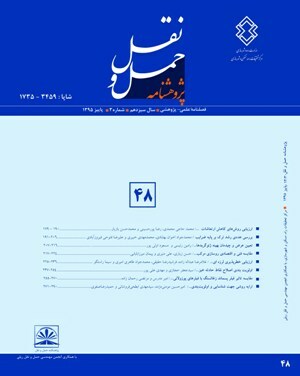 در نوع و میزان این فرسودگی­ها و میزان گسترش آنها عوامل متعددی تاثیرگذار می­باشند. هر یک از این عوامل چنانچه مورد توجه و رسیدگی قرار نگیرند، منجر به کاهش عمر مفید سازه خواهند شد. در این پژوهش پس از بررسی­های انجام شده با استفاده از روش FMEA-FUZZY، مشخص شد که زلزله به عنوان مهمترین و تاثیرگذارترین عامل خرابی پل­ها در حالت بهره‌برداری است. به همین دلیل به بررسی دقیق زلزله وارده به پل­های شهر بابلسر، که یکی از مهمترین شهرهای توریستی کشورمان بوده و پلهای این شهر دونیمه شرقی و غربی این شهر را به متصل نموده و نقش حیاتی در این شهر را داراست، پرداخته شده و پس از مدلسازی پل­ها در نرم­افزار SAP2000 ، احتمال خرابی هر یک از اجزای سازه­ای پل محاسبه گردید. سپس با استفاده از روش FMEA-FUZZY میزان ریسک هر یک از پل­ها در برابر زلزله تعیین شده است. تفاوت رویکرد ارایه شده در این پژوهش با پژوهش­های پیشین در این است که با استفاده از این رویکرد می­توان با بودجه­ای مشابه حالات قبلی، وضعیت کلیه پل­ها را اصلاح نموده و به حالت نسبتا مناسبی رساند در صورتی که در پژوهش­های پیشین، با استفاده از روش‌های تصمیم­گیری­چند معیاره فقط پلی که در بحرانی­ترین حالت بوده را به عنوان پل بحرانی انتخاب نموده و کل بودجه ابتدا برای این پل صرف می­گردید. نتایج حاصل نشان می­دهد که هر کدام از پل­ها در چه پارامترهایی دارای ضعف می­باشند بنابراین لازم است تمهیدات لازم در جهت مقاوم­سازی این پل­هادر برابر زلزله انجام گیرد تا از مشکلات احتمالی به وجود آمده در اثر بروز زلزله بر روی این پل­ها جلوگیری به عمل آید. در نهایت نتایج نشان می­دهد که کمانش پایه­های فلزی در پل اول و دوم در ضرورت اصلاح قرار دارند. Bridges with each structural shape and with every kind of materials that are made, soon or late, fatigue effects are appeared in them, among kind and rate of these fatigues and their expansion trend, numerous factors are effective such as climate situation, flood or earthquake occurrence, load increase more than design rate, design qualification and performance and kind of materials. If each of these factors are not considered leads to decrease of useful life in structure. In this research after doing investigations by using FMEA-FUZZY method, it became clear that earthquake is known as the main and the most effective factor of bridges ruin in utilization case. For this reason, imposed earthquake on Babolsar bridges was strictly investigated and after bridges modeling in SAP software, probability of ruination in each structural element of bridges was calculated. Then, by using FMEA-FUZZY method, rate of risk in each bridge against earthquake becomes clear. Difference of presented procedure in this research with previous research is that by using this procedure it is possible to correct the situation of all bridges by budget similar to previous cases. And reaching to relatively proper case, while in previous researches, by using multi-criterion decision making method, we only selected a bridge as a critical bridge that was in most critical case and all budget was spend first for this bridge and then was spend for other bridges. The results show that each of bridges in which parameters has debility. So, it is necessary to do all schemes for resisting these bridges against earthquake and to prevent from probable difficulties, caused by earthquake on these bridges. Finally the result show that steel legs buckling at the first bridge and the second is necessary for reform. - آذر، ع. و فرجی، ح.، (1389)، "علم مدیریت فازی"، چاپ چهارم، تهران، مرکز مطالعات مدیریت و بهره­وری در ایران. - Abdelgawad, M., and Fayek, A.R., (2010), “Risk in the management construction industry using combined fuzzy FMEA and fuzzy AHP”, Journal of Construction Engineering and Management, 136(9), pp.1028-1036, ASCE. - Adey, B., Hajdin, R., and Bruhwiler, E., (2003), “Risk-based approach to determination of optimal interventions for bridges affected by multiple hazards”, engineering structures, 25, pp. 903-912. - Aktan, A.E., Helmicki, A.J., Hunt, V.J., (1996), Issues related to intelligent bridge monitoring Proceedings of Structures Congress XIV. Ghosh S.K., Mohammadi J., Editors. ASCE, 2, pp.750-7. (­2012), “Innovation and Improvements in Project Implementation and Management; Using FMEA Technique”, 41, pp. 418 – 425. - Dunker, K.R. and Rabbet, B.G., (1993), “Why Americans bridges are crumbling”, Scientific American Magazine, pp.66-72. - Huang, Y. and Huang, H., (2012), “A model for concurrent maintenance of bridge elements”, 21, pp.74-80. - Johnson, P.A. and Niezgoda, S.L, (2004), “Risk-based method for selecting Bridge Scour counter measures”, Journal of Hydrolic Engineering, 130(2), pp.121-128. - Kumru, M. and Kumru, P.Y., (2013), “Fuzzy FMEA application to improve purchasing process in a public hospital”. Applied Soft Computing, 13(1), pp.721–733. - Lounis, Z., (2004), “Risk-based maintenance optimization of­ bridge structure”. - McIntyre, D., (1997), “Weak bridges: the impact on freight movement”. Proc. Conference on British Roads: National asset or national Disgrace, Sponsored by Surveyor Magazine and the Automobile Association. - Petroski, H., (1995), “Engineers of Dreams”, Allfred A. Knopf, NewYork. - Rayal, M.J., (2006), “Bridge Management”, 1st ed., Trans. Ministry of Roads and Transportation, Department of Education, Research, and Technology, Transportation Research Center. - Wang, J., Shi, Z. and Nakano, M., (2013), “Strength degradation analysis of an aging RC girder bridge using FE crack analysis and simple capacity-evaluation equations”, 108, pp. 209–221. - Wang, Y.M. and Elhag, M.S., (2006), “Fuzzy-TOPSIS method based on alpha level sets with an application to bridge risk assessment”. Expert Systems with Applications, 31(2), pp. 309-319. - Wang, Y.M. and Elhag, M.S., (2007), “A Fuzzy Group Decision Making approach for bridge risk assessment”, Computers & Industrial Engineering, 53, pp.137-148. - Wang, Y.M. and Elhag, M.S., (2008), “An adaptive neuro-fuzzy inference system for bridge risk assessment”. Expert Systems with Applications, 34(9), pp.3099-3106. - Wang, Y.M., Liu, J. and Elhag, M.S., (2008), “An integrated AHP-DEA methodology for bridge risk assessment”, Computers &Industrial Engineering. 53, pp. 513-525.